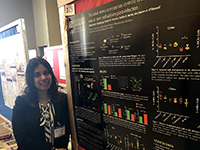 Manisha Chandwani, a graduate student studying pharamacology in the Graduate School of Pharmaceutical Sciences, won a Provost's Award for Outstanding Reserach and a cash prize for the project 105 The adult immune response controls viral infection in thebrain and induces neural stem cell activity post-infection under the guidance of faculty advisor and associate professor Dr. Lauren O'Donnell. Fellow graduate students Kristen Fantetti and Yashika Kamte helped with the research. School of Pharmacy and Graduate School of Pharmaceutical Sciences students presented 19 posters at the symposium.